Centuries ago the human race fought its first great war against an alien race - and lost. A tiny population of human beings fled to distant Safehold. Centuries later their descendants have forgotten their history; for them, life has been an eternal Middle Ages, ruled by the Church of God Awaiting, whose secret purpose is to prevent the reemergence of industrial civilization. But not all of Safehold's founders were onboard with this plan. Those dissidents left behind their own secret legacies. For centuries, the world of Safehold, last redoubt of the human race, lay under the unchallenged rule of the Church of God Awaiting. The Church permitted nothing new - no new inventions, no new understandings of the world.What no one knew was that the Church was an elaborate fraud - a high-tech system established by a rebel faction of Safehold’s founders, meant to keep humanity hidden from the powerful alien race that had destroyed old Earth. Now the battle for the soul of the planet Safehold has begun.The Kingdom of Charis and the Kingdom of Chisholm have joined together, pledged to stand against the tyranny of a corrupt Church. The youthful Queen Sharleyan of Chisholm has wed King Cayleb of Charis, forging a single dynasty, a single empire, dedicated to the defense of human freedom. The world has changed. The mercantile kingdom of Charis has prevailed over the alliance designed to exterminate it. 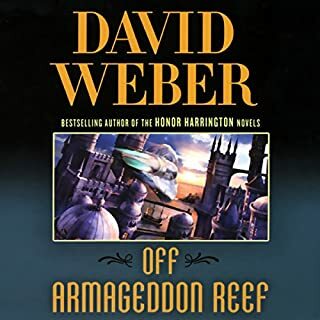 Armed with a multitude of small technological improvements - better sailing vessels, better guns, better devices of all sorts - Charis faced the combined navies of the rest of the world at Darcos Sound and Armageddon Reef, and broke them. 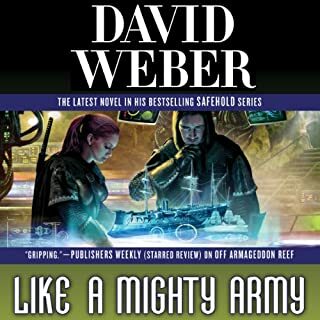 At the Sign of Triumph: David Weber's New York Times best-selling Safehold series began with Off Armageddon Reef, By Schism Rent Asunder, By Heresies Distressed, A Mighty Fortress, and How Firm a Foundation. The Church of God Awaiting's triumph over Charis was inevitable. Despite its prosperity, the Charis was a single, small island realm. It boasted less than 2 percent of the total population of Safehold. How could it possibly resist total destruction? The Church had every reason to be confident of a swift, crushing victory, an object lesson to other rebels. But Charis had something far more powerful than simple numbers. It had a king, a crown prince, and a navy prepared to die where they stood in its defense. It had the Brethren of Saint Zherneau, who knew the truth about Safehold's founding. Who knew that the Church of God Awaiting was a monstrous lie. And it had Merlin Athrawes, last survivor of long-vanished Earth. Merlin, the cybernetic avatar of a woman dead over 1,000 years, who was determined to break the Church's grip upon the human mind and soul. So after eight years of war, it is not Charis but the Church that stands upon the brink of defeat. But the Church still commands immense resources, and - faced with the unthinkable - it's decided that it, too, must embrace the forbidden technology that has carried Charis so far. In the end it is simple, for only one can survive. The lines are drawn, the navies and armies have been raised, and all of Safehold is poised for the final battle between those who believe in freedom and those who would crush it forever. This is a great end to the beginning and yes a long way to still travel but what a book. This was probably my favorite of the Safehold books so far. Oliver Wyman is such a treat to listen too as well. 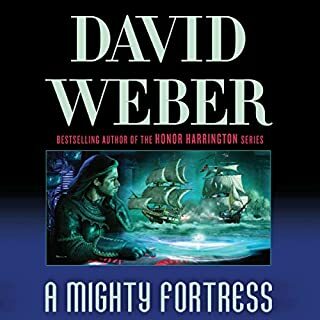 If you are new to the series I recommend starting starting with book one. Also know this even though this book is around 40 hours it goes by fast. 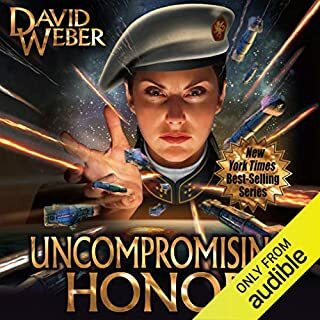 Thank you Mr. Weber for yet another fantastic work I will enjoy time and time again. 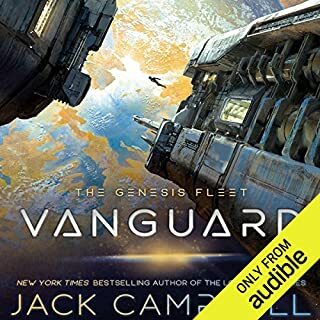 I bought both the Kindle and Audiobook version of this book so I can switch back and forth between them (great feature, by the way, to be able to keep them synced up! ), and when I switched from the second chapter on Kindle to the Audiobook, it had jumped ahead by several chapters. 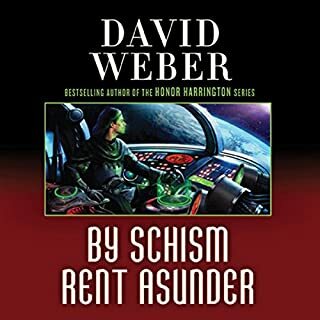 After doing some comparison, I found that the Audiobook is missing the first 26 chapters of the book. Please fix! Easily the best novel in the series since book 1! As the war for the soul of Safehold is just getting started, the war with the Church of God Awaiting edges toward a bitter end. Thus novel is the one we've been waiting for! Aside from an odd overuse of the "flaring nostrils" device (c'mon, you thought that too), the story & characters are beautifully developed. The narrator is FANTASTIC and we finally see the end of the beginning. 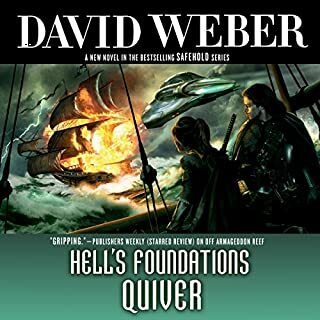 Can't wait to see what direction Weber goes with book 10 come January 2019! I thought this was to be the final book in the series. (# 10 in the series coming out in 2019). It is anticlimactic. The story in the 9 books would have been more enjoyable had they condensed to about three books. Then the author would have had the time in his and our lifetimes to get to the story that we all expected when we started the series. 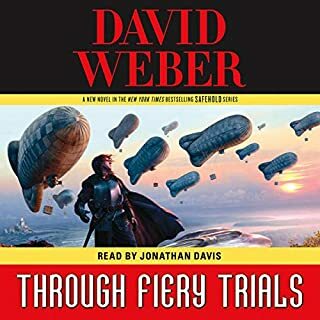 Don’t get me wrong, David Weber is good. The books are well written. But, after nine books, we are left hanging and waiting for the science fiction series storyline to start. Each book was Worth the wait , one of my all time favorite series. This book was a good end to a good series. P.S. MR Weber - Please continue this Story line ! excellent performance. rushed ending has obvious missing developments such as why and how thirsk became regent. 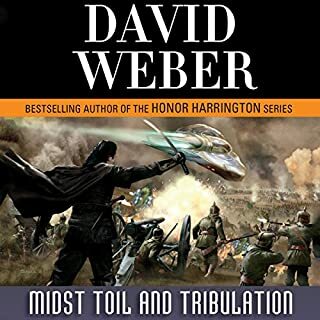 on the other hand there are very detailed side plots with characters who are introduced and then killed, making this seem like a collection of short stories in the safehold war. The story should have ended in 5 books less, great story but itnis being dragged out to a degree that makes Wheel of Time looks like childsplay. 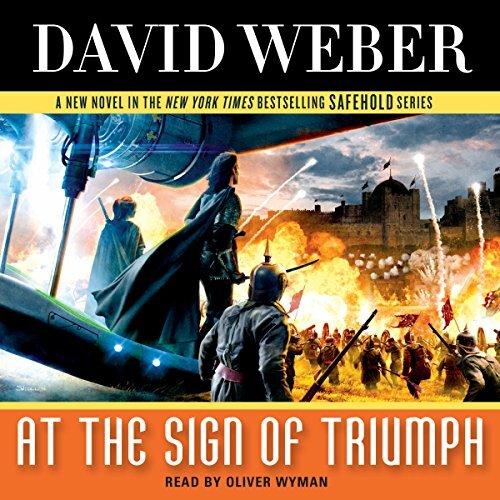 What disappointed you about At the Sign of Triumph? Wrapped up in a rush, and the ultimate story of how the human race rebuilds and confronts the aliens is left untold. You never find out what was under the temple either, so the ultimate confrontation with that is left unfinished as well( probably a bigger deal in the immediate story line). For the grand finale the book seemed tired, drawn out in most places and rushed in others.Characters that appeared in previous books aren't even present now while new characters we won't see after a given chapter get excessive wordage that adds nothing and makes me not care any more about them then before. The author continues with excessive detail that, for me at least, does not add anything to the story. A major side plot that was start a book or two ago was hurriedly wrapped up in this book and the excessive use of the Duex Ex Machina of the Sejin helped it along. For all of the value it added to the story the author could simply have kept to his "tell not show" style and told us all about it rather then waste several pages detailing what was telegraphed well beforehand. 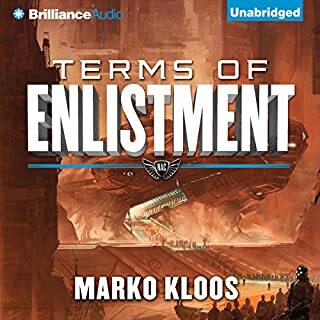 I suppose my biggest issue conti8nues to be that this is sold as "science fiction" when really it's historical military fiction or perhaps "alternative fiction". The occasional advanced technological device and "name drift" does not a science fiction book make. Certainly nothing from the author. 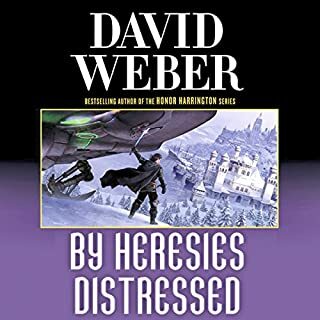 After wading through his Honor Harrington Series and then the Safehold series I've decided to give up on Mr. Weber and look for higher quality writers. Have you listened to any of Oliver Wyman’s other performances before? How does this one compare? I enjoyed Oliver Wyman's performances and he's as good as ever and manages to keep the character's outlandish names straight from book to book. If Oliver Wyman had not been the narrator I would likely not ahve bought this book. Disappointment and sense of relief that the series I'd wasted time and money on was fianlly at the "end". I know this is supposed to only be the end book of the "first arc" but I won't be continuing it. 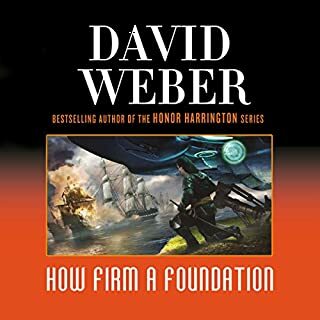 I started the series thinking it would be "Science Fiction" and it was simply a cover for the author's true passion of historical naval warfare and a way for him to expound upon his own religious views. Author's should "show" rather then "tell". Sadly Mr. Weber seems incapable of this action, not surprising given the hundreds of characters he insists on filling his books with. Mr. Weber insists on telling us that character X is the best at Y but he never demonstrates how X is the best at Y. Even if character X is good at Y he's most likely to die if he's on the "bad" side even if skill/trait "Y" should have kept him alive. Another consequence of having so many minor/one-off characters is that they all sound the same at times. The "What's That? "/"What's what?" is one example.